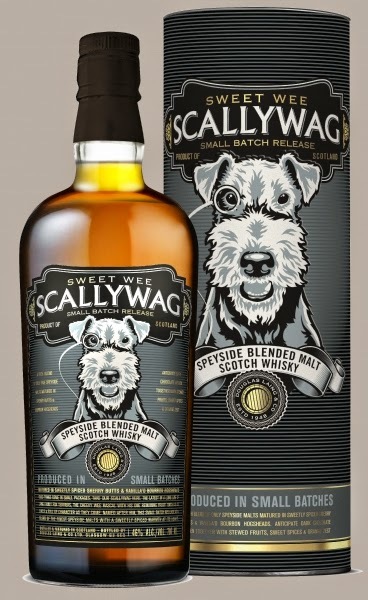 Sweet Wee Scallywag (46.0%): This is the younger sister of Big Peat (which I will review very soon...) of Douglas Laing & Co. Ltd. and it is a blended malt. The company introduced the brand almost a year ago and it is created by using Speyside malts only, including Mortlach, Macallan and Glenrothes among others. It includes a good deal of whisky matured in Spanish sherry butts and is non chill-filtered. The dram is named after the long line of Douglas Laing family Fox Terriers. Let's see what it tastes like. Color: Coppery, medium amber and clear with visible thin legs on the glass. Nose: Young sherried alcohol, unstruck matches, lambswool and fresh blanched almonds. Candied orange zest, milk chocolate and carrot cake covered with thick frosting. Adding a few drops of water amplified the sulphury notes a notch which I didn't appreciate very much but also didn't bring it to a disturbing level.. Palate: Spicy with nutmeg, cinnamon and toasted oak notes. Artificial vanilla extract, chili powder and custard. Fairly young on the palate as well but it works definitely better here on the palate than it did on the nose. No traces of sulphur. By the way water is not the best friend of this dram... It flattened out the taste profile quite a bit. Finish: Peppery (very peppery...) with cocoa powder and soot. Black garden soil and cracked black peppercorns. Overall: A very enjoyable high quality young blend. Perfect for fall and winter months. Very Christmasy... It is kind of a bottle you would kill in two nights in front of your TV screen when watching an entire season of your favorite show cuddled under the blanket. I can totally imagine myself doing that... No regrets after whatsoever... I actually was planning to start with Peaky Blinders for some time and it is a long weekend here in US. Hmm, I might have something here... Thanks to one and only Brad Jarvis from International Spirits and Wines for the sample.